This one is four years coming. I can’t even remember if I ever posted the “part 3” or not, but was considering blogging about some things relating to being a being a dancers’ musician and thought I’d look up the blogs I’d done regarding this. I still can’t believe I’d blogged those over four years ago, but there it is and here is part 3! For those interested, here are part 1 and part 2. As I recently gave another intervew to Julia Zay that is a part of a series of pieces talkin about contemporary bellydance musicians, some of the things we discussed have been on my mind lately especially regarding actual collaboration between dancers and musicians (in contrast to havin dancers dance to can music) and especially regarding copyright and licensing of music for perormances or media that will be sold (show DVDs, for example). But a few amendments to the dance exposure I mentioned in the previous (part 2) installment of this blog series, since it has been some four years since that post. I’ve since been dancing intermittently with the Louisville Ethnic Dancers when I’m actually in town and not gigging. This has given me some valuable insight into dance from a dancers side, especially regarding how to have the right musical accents and style for particular dances. I’d mentioned in a previous post the idea of having a “musical accent” and how that can get in the way of understanding how the music works with the dance, This is where much of that experience is coming from. As I also joined a Balkan band (primarily as a drummer with some singing), Kermes, in Bloomington Indiana I’ve gotten the chance to play tons of the Balkan, Eastern European and Western Asian tunes and styles that I learned how to dance to with the LED. Also, one of the members of the group, Gergana, is from Bulgaria and is one of the folk dance teachers in Bloomington. As I’ve also blogged about occasionally here, I’ve started up more intimate projects with individual dancers. The first attempt, which hasn’t really gotten off the ground, was Natyasastra which was to focus on Indian Music and Dance (especially Bollywood). Circumstances have prevented this particular project from doing live perfomances though that may still change in the near future. Another project, Raks Makam, has actualy done some unofficial performances. There’s been a line-up change as Taletha, who moved to Colorado, is no longer active dancing in my area. She remains in an ‘artistic director’ type of position with the project while one of her dance students, Jessica Hamilton, takes up the reins of the dance. 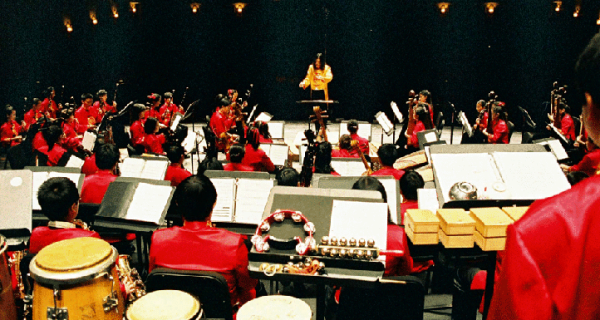 This project focuses mainly on Central Asian dance and music. The latest duo project, Secondhand, is probably the most active. We call ourselves a “Experimental Vintage Goth” Bellydance and Music duo, and I’ve had great fun working with Celeste on trying new things. Along with joining the Balkan band last year, I’ve been playing regularly with a Klezmer group, the River City Klezmer Band, and have gotten some great experience playing traditional Klezmer and Eastern European Jewish dance music. Also, since 2008, I’ve been playing with Ahel El Nagam, a Classical Arabic Group based in Louisville. We play much more traditional Middle Eastern music than what you might hear from me in, say, il Troubadore. Lately I’ve been drumming for the group as we’ve also had a number of line-up changes, but it is really wonderful getting the chance to work on some of the classica bellydance tunes in a more traditional setting than I have in the past. So, as you can see, I’ve expanded my collaborative projects to go well outside of working with just bellydancers and in a sense have come full circle at being a much more versatile musician for them. 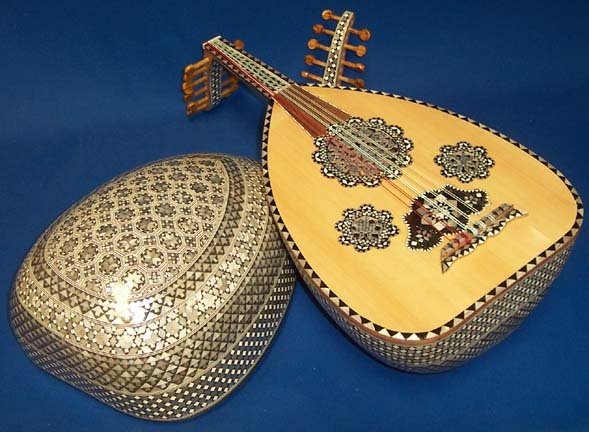 "…inspired by the shape of his son’s bleached skeleton"
Tradition holds that the origin of the oud isn’t so tranquil, though. The Bible attributes the birth of music to Yuval, son of Lamech (the great, great, great grandson of Adam), but Arab legend tells a slightly different story, in which Lamech accidentally kills his other son Tuval-Cain (after accidentally killing the original Cain) and hangs his body to dry in a tree, with the skeleton serving as a model for the first instrument. We don’t want to know how they think the tuba was invented. 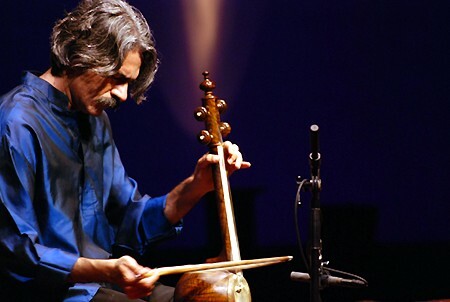 With that, I leave you this beautifully poignant article, A Fabled Iraqi Instrument Thrives in Exile, from the New York Times and this wonderful video of Rahim Alhaj and Souhail Kaspar recording “Rast” for Mr. Alhaj’s album, “When the Soul is Settled: Music of Iraq,” for Smithsonian Folkways Recordings in 2006.